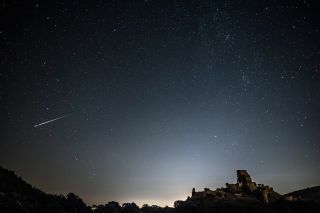 A Perseid Meteor flashes across the night sky above Corfe Castle on August 12, 2016 in Corfe Castle, United Kingdom. A group of scientists has used starlight to test a feature of quantum mechanics that gave Albert Einstein the creeps. Entanglement is what Einstein referred to as "spooky action at a distance." It's a phenomenon by which one particle can effectively "know" something about another particle instantaneously, even if those two particles are separated by a great distance. It appears to go against the idea that nothing, not even information, can travel faster than the speed of light. If humans were to discover an intelligent species living on a planet 10 light-years away, it would take 10 years to send them a message that said "hello," and 10 more years for their reply to come back to Earth. If we discovered a civilization on an even more distant planet, it could take many human lifetimes just to start a conversation. That's the law, according to Einstein: nothing can travel faster than the speed of light, so communications conducted over vast cosmic distances come with an inherent delay. And yet, there is a feature of quantum mechanics that seems to violate that principle. Quantum mechanics is an area of physics that deals with subatomic particles. In this seriously small realm, things behave in a way that can seem totally contradictory to what we experience in the macroscopic world. One quantum phenomenon called entanglement postulates that pairs of entangled particles can effectively exchange information instantaneously. In theory, these particles could communicate instantly over vast cosmic distances. This idea rattled Einstein; he never fully accepted it. And even today, scientists are working to make sure this strange phenomenon is real. One of the more famous fables in quantum mechanics is about poor Schrödinger's cat, who got stuck in an uncertain state: the feline was neither alive nor dead until someone opened the box to find out. Uncertainty is another one of the truly freaky features of quantum mechanics. In the real world, something can either be alive or dead; in the quantum world, there's a third option in which the object's state hasn't yet been determined. To break the uncertainty, someone has to measure it (open the box) and force the object (cat) into one state (alive/dead). Entangled particles also exist, initially, in an uncertain state. Particles can't be alive or dead, so instead think heads and tails. If you flip a coin 100 times, odds are it will come up heads close to 50 times and tails close to 50 times. If I then flip my own coin 100 times, there's a high probability the split will also be close to 50/50. But if our coins are entangled, then the outcome of your flip determines the outcome of my flip — perhaps our entanglement is such that every time you flip heads I flip tails. If we flip our coins enough times, our entanglement will begin to become obvious, because my outcome of my flip is no longer random, but determined by your flip, and the odds of my flipping tails every time you flip heads get lower and lower the more we flip. That's sort of how scientists can measure entanglement. Instead of flipping a pair of coins over and over again, researchers measure the properties in many, many of pairs of entangled particles (entanglement can only be measured in a pair of particles once). But the scientists have to be sure that what they're seeing isn't just random chance. A statement from the Massachusetts Institute of Technology (MIT) poses the question, "What if there were some other factors or hidden variables correlated with the experimental setup, making the results appear to be quantumly entangled, when in fact they were the result of some nonquantum mechanism?" In other words, how can scientists be sure there's not some unseen factor affecting their experiments, and making it seem as though the examined particles are entangled, when in fact they are not? A physicist named John Bell showed that if entanglement exists, then there must be a minimum degree of correlation between entangled particles when scientists measure them; this is known as Bell's inequality or Bell's theorem. In some entanglement experiments, the detector measures a property of light particles called polarity; the detector must be oriented in one of two directions, and only photons polarized in the same direction (one of two possibilities) can pass through. In order to make sure that the detector is not somehow influenced by one of those mysterious forces that could corrupt the experiment, researchers will use random-number generators to determine the direction of the detector. That random choice is made "in the split second between when the photon leaves the source and arrives at the detector," according to the MIT statement. "But there is a chance, however slight, that hidden variables, or nonquantum influences, may affect a random number generator before it relays its split-second decision to the photon detector,” the statement said. "At the heart of quantum entanglement is the high degree of correlations in the outcomes of measurements on these pairs [of particles]," David Kaiser, professor of physics at MIT and co-author on the study, said in the statement. "But what if a skeptic or critic insisted these correlations weren't due to these particles acting in a fully quantum mechanical way? We want to address whether there is any other way that those correlations could have snuck in without our having noticed." Every photon of starlight that reaches a telescope has a particular wavelength. In the new study, which was conducted in Vienna, Austria, the researchers set up a couple of telescopes and started collecting photons (the telescopes and detectors were placed on rooftops at the university, as well as the roof of the Austrian National Bank). They selected a reference wavelength, and each photon that hit the telescope would either have a longer or shorter wavelength than that reference point. A photon with a longer wavelength switched the detector to one orientation, and a shorter wavelength switched it to the other orientation. "With bright stars like these, the number of photons coming in can be like a firehose," Andrew Friedman, an MIT research associate and co-author on the new study, said in the statement. "So we have these very fast detectors that can register detections of cosmic photons on subnanosecond timescales." The researchers measured about 100,000 pairs of entangled photons with this method, and their results suggested that the particles were truly entangled. The most distant stars used in the experiment are about 600 light-years away, which means the photons were emitted 600 years ago. If those photons were somehow tied to the state of the entangled photons, that connection would have to have been established 600 years ago, according to the statement. "This experiment pushes back the latest time at which the conspiracy could have started," Alan Guth, a professor of physics at MIT and another co-author on the new study, said in the statement. "We're saying, in order for some crazy mechanism to simulate quantum mechanics in our experiment, that mechanism had to have been in place 600 years ago to plan for our doing the experiment here today, and to have sent photons of just the right messages to end up reproducing the results of quantum mechanics. So it's very far-fetched." The study doesn't fully eliminate the possibility of some mysterious force acting on the experiment, but it certainly puts tighter restrictions on how and when such a thing could happen. "The real estate left over for the skeptics of quantum mechanics has shrunk considerably," Kaiser said. "We haven't gotten rid of it, but we've shrunk it down by 16 orders of magnitude."